When I read this quote from Tom Robbins’ book, a smile of recognition blinked on my face. That is it, that’s me! I am a great passenger too! Almost as if I had found unexpected comfort in gaining such trivial title, which in its simplicity was able to disguise my reluctance to drive, and the company of someone who could also cherish the rare joy of sharing such status felt extremely reassuring. The truth is Sissy Hankshaw is an adept hitchhiker, I am just a passenger forced to remain one by an inexplicable fear of driving. Back in my teens, all my friends couldn’t wait to turn 18 to take their driving test and finally get driving, leaving behind their noisy mopeds and ridiculously slow bus journeys. I put it off with what I now recognize being a silly chain of excuses. Then I moved to London, where driving is more a nuisance than a commodity and so my driving duties got postponed once again. And now here we are, living in the Ecuadorian Andes with a pick-up truck named Tabatha which is solely driven by Fintan. With the prospect of potentially going back to UK for work (pre-pregnancy plan), Fintan decided that it was time for me to grow some balls and tackle my driving fears. The thought of Tabatha being left untouched on our property whilst I used the services of taxis to get home from work in his absence was unnerving. So Fintan put his foot down (pun not intended), I knew my excuses had come to an end and so I decided to enrol at a local driving school, Conducir. Calling it a school is probably a little too ambitious… The actual headquarters of Conducir are based in the city of Loja, at 40 Km from us. There they offer ten days courses where one hour of theory and one hour of practice daily magically turn you into a driver upon completion. The prospect of having to reach Loja every day for ten days sickened me but they reassured me they offered courses in Vilcabamba to facilitate those who like me didn’t want/couldn’t reach Loja. I meet the representative of the school outside our faithful minimarket in town, where a rushed outline of how to proceed to join the course emerges with a distinct emphasis on making a deposit of $175 to the school’s account. I felt like I had to make clear to him that I am fearful of driving, and that it took me so long to gain some courage to finally enrol and this was a sort of a rite of passage for me, and and…oh dear I must have sounded like a right plum!! He didn’t seem to acknowledge this was a huge step for me, I felt silly for expecting some sympathy or recognition from this guy in such a rush to close the deal and distribute his publicity fliers. The $175 deposit got repeated again whilst I tried to bring the conversation to the actual technicality of the course. Like…where is the theory class going to take place? Theory class?? There won’t be any theory class señora, but we will give you some books to read if you like. Right. So then we agree to make this $175 deposit, get all the paperwork necessary to be enrolled, and start the following Monday with the first of the 15 hrs of my driving class. A phone call a few days later changes this agreement to three hrs daily for 5 days instead due to some whatever reason. Ugh! From zero driving to three hours a day for 5 days…and that’s it??? Remembering that I am in Ecuador and giving up the expectation of even the most basic level of professionalism and accuracy I just went with the whatever approach and agreed with it. So Monday 2-5 it is. Ready with clammy hands, there I was waiting for my driving instructor to turn up at the location agreed with the Conducir car. Half hour later I decide to call to check I was in the right spot because he hadn’t turned up yet. Oh sorry señora, he just had an accident on the way so won’t make it today, is it ok if you start tomorrow instead? We start on the Panamerican highroad, the highway that touches Vilcabamba on its way to Peru. 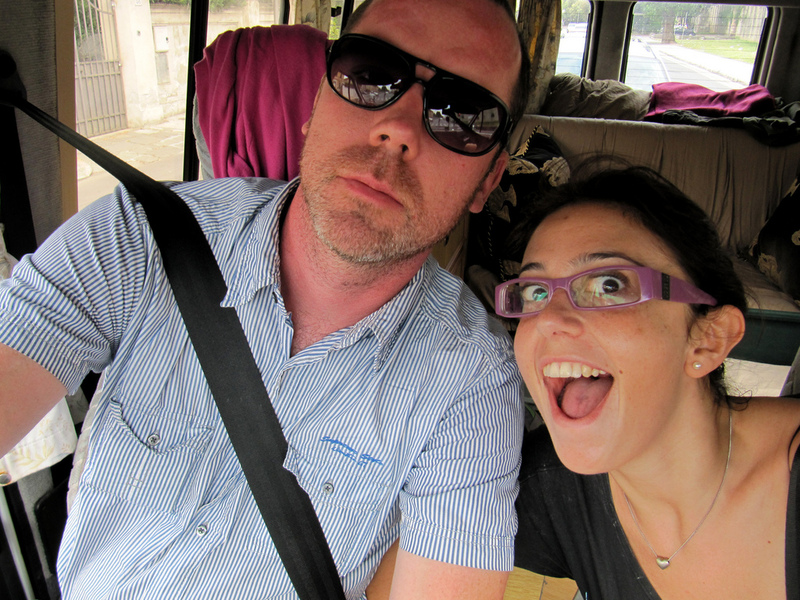 Nice enough guy, Danny teaches me about the gear stick, and the pedals and the lights on the dashboard. Then he makes me hop on the driver seat and drive on the sunny road, and without making me put a seatbelt on we engage in chit chat where he confesses to have been a driving instructor for only two months and that he’s only doing it whilst looking for a better job. Nice. Nothing like feeling the passion and commitment of people who love their job!! Two hours of driving up and down in second gear, making a u-turns where possible, stopping and starting… being overtaken by huge trucks honking at my ridiculous speed unsympathetic towards the obvious fact that it’s a learner’s car….Accents of Italian road rage emerged really soon. When the two hours driving were up, I got off the car feeling very sweaty and with my hands still in gripping-the-steering-wheel mode although somewhat relieved. Fintan enjoyed waiting for me sipping cold beers on the same seat of the minimarket where my driving career started… I was excited; driving is not a big deal after all and I could possibly enjoy being a driver! After three days of second gear we moved onto third, attempted some lame parking and reverse motion and short of 3hrs of my driving allowance, Danny makes me sign a paper to confirm we have fulfilled the 15hrs allocated and asked me, as a favour, that if the admin of Conducir called to check on the advancement of the course, to reassure them it all went well and that we had completed it successfully. And then is when I learnt that the practice exam is not to be taken with an external agency but will be directly looked after Danny himself! Actually, it’s done, you’re allright, he says, wink wink nudge nudge. Great. 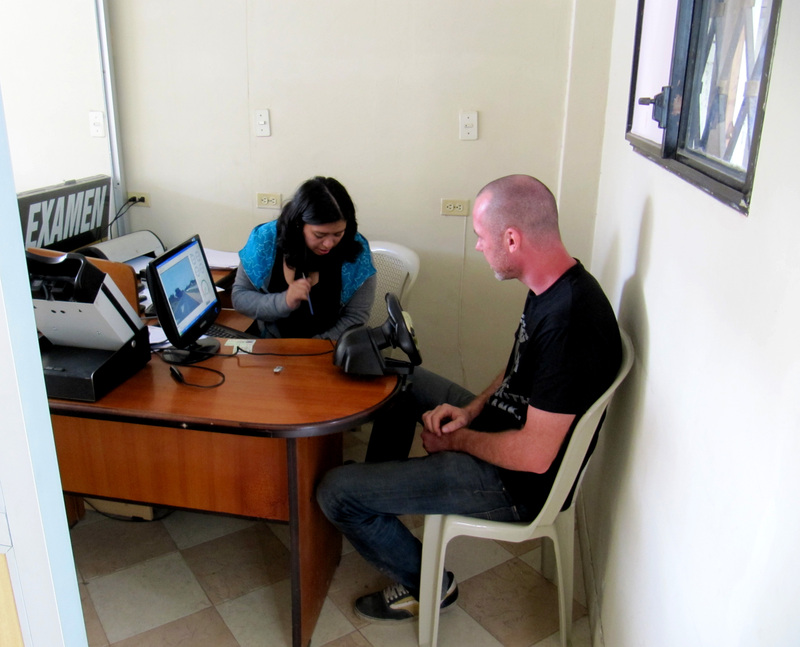 A few weeks later we go to the Conducir office in Loja to apply for Fintan’s driving licence. 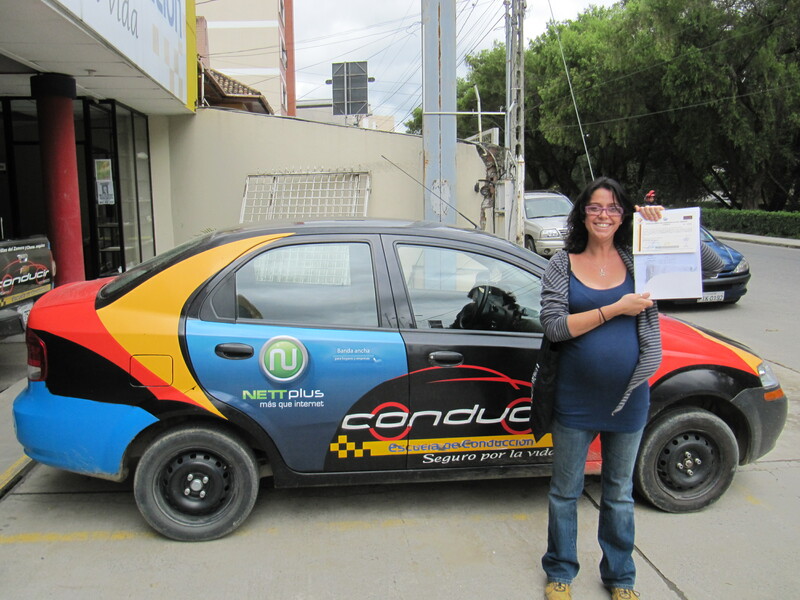 The law permits foreigners to drive with their country’s licence up to three months of stay in Ecuador, after that an Ecuadorian one must be obtained. So we enquire at Conducir where he still has to pay for the full course although no classes will need to be taken, but it is a must that he passes the four tests required to get the licence: the theory, the practice, the psychological and the psycosometric. Practice: takes place there and then. Fintan took an instructor for a ride around the block to confirm his proficiency in driving. Tick! Psychological: we both had to fill in a 20 multiple choice questionnaire, with questions such as “would you be driving under the influence of alcohol” yes-no-maybe or “ should you retaliate towards the aggressive behaviour of another driver” yes-no-maybe…We both passed. Tick! Psychosometric: our vision and hearing got tested as well as our reflex response. The latter saw us behind the screen of a pc, holding a videogame steering wheel and foot on some pedals on the floor. According to some lights appearing on the screen we were asked to stop, turn left or turn right in less than 10 sec. Theory: the books promised never came. I said I felt more comfortable in reading some books before applying for the test but the receptionist instead hands us over two copies of the 20 multiple choice questionnaire and encourages us to take it there and then. She reassures us that she will be evaluating it and that she is sure we’ll be fine. An invisible wink appears on her face. So Fintan and I sat down and wildly guessed all these questions, mainly focused on legal aspects of law infringements and such. We got 12/20, 4 points short of passing. The lady gave us back the paper and asks us to work the wrong ones out. And so we achieve 18/20. 17 May	This entry was published on May 17, 2014 at 5:24 pm and is filed under Ecuadorian culture, Uncategorized. Bookmark the permalink. Follow any comments here with the RSS feed for this post. Felicitations, and take heart! A good friend who never has had a license has, nevertheless, been blithely driving scores of people to Drink for years! Not only do I wish far better for you, but rest content in knowing that your pleasant smile will soothe, if not remove completely, any pain the front of your car may, heaven and all other powers forfend, impose on anyone you meet automotively.